A simple thought from Jerusalem: If you lived in Judea at the time of the Second Temple, what would your day look like? It seems that there were a few dissenting opinions in response to that, namely some who believed in wholly spiritual acts, while others lived a pretty normal routine, peppered with the occasional trip to the Temple to bring a sacrifice in gratitude or in awe. Behind the scenes at the Israel Museum today, I learned that things pretty much stay the same. Political discourse, powerful allies and vigorous debate were par for the course in biblical times and beyond. The Essenes disagreed with how things were run in Jerusalem and at about 180 BCE, took the Judean desert where they could develop their own theology and sense of self. These scribes left us an indescribable treasure of scrolls and papyrus, known as the Dead Sea Scrolls. Across 13 caves and now with the 14th just discovered, our wealth of knowledge increases tenfold, as we read the hebrew and aramaic scriptures that speak to us across time and draw us closer to our ancestral, biblical roots. Don’t drop your guard as an active, outspoken lover of Zion; there are those who would erase Israel’s heritage, and our Judeo-Christian history. Even with these scrolls, our detractors try to stir up controversy, but I see it as a good thing, since the more outlandish their claim, the stronger our stand. See here for one crazy, recent example. Israel readies to celebrate 70 short years of existence, with her birthday this May. The museum is preparing an impressive display to mark the occasion – and you should be here to see it. 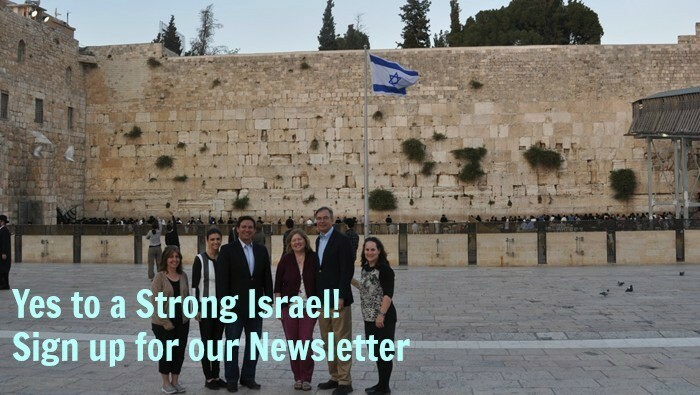 To be a part of this historic feeling, we hope you’ll join us in Israel this spring. Let us know if you are available and we will share a number of opportunities to be here together with us, from congressional missions to personal tours. We know you are a friend to Israel, advocating and educating for a better, stronger understanding between our nations. We believe there is always more for us to do together, and it is our goal to reach each and every person with even the slightest connection, to strengthen that bond and make it work. Share this message and be in touch, so you don’t miss a thing! For years, America, Britain and the EU have insisted that Mahmoud Abbas is a moderate and a statesman-in-waiting who deserves to be rewarded with a state of Palestine. For years, they have insisted that he is prepared to live alongside the state of Israel. For years, they have blamed Israel for intransigence in not believing this and thus not agreeing to give him land that they thought he would use to threaten the lives of its citizens. For years some of us have argued that Abbas should be considered instead a political and diplomatic pariah. We have said he is a deep-dyed antisemite, having written his “doctoral” thesis on denying the Holocaust. We have drawn attention to his regime teaching its children about seizing the whole of Israel, and that their greatest goal should be to murder Jews. Vice President Mike Pence met with Jordan’s King Abdullah II in Amman, Jordan on Sunday and praised the U.S.-Jordan alliance. In particular, Pence applauded Jordan’s role in the campaign that defeated the Islamic State caliphate in Syria and Jordan. Sitting next to Pence, Abdullah reinstated his outspoken opposition to President Donald Trump’s December 6 announcement recognizing Jerusalem as Israel’s capital and committing the U.S. to moving its embassy to Jerusalem, in accordance with U.S. law. Last month, Abdullah attacked Trump’s move and referred to it as “null and void.” In the weeks that followed Trump’s December 6 announcement, Abdullah went to Europe to lobby European governments to oppose the American move.